​"KING of Indian Cinema and Bollywood" Amitabh Bachchan, this picture in the 1990's. 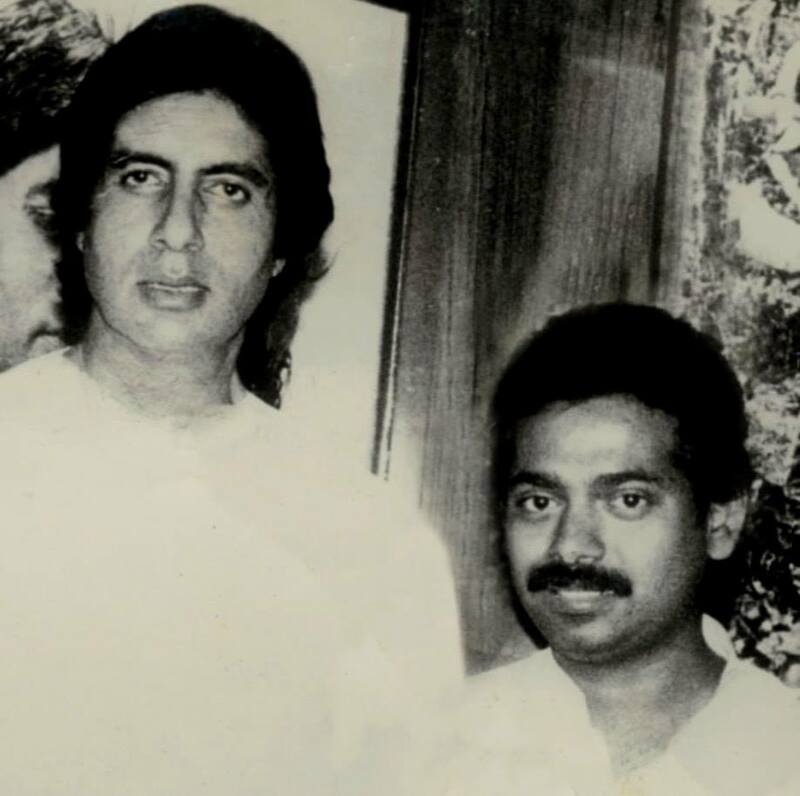 Babu Kishan worked with Amitabh as a Music and Film Consultant, this is not just a fan picture, Babu knew Amitabh personally for 1976 for decades. Babu Kishan is in the process of writing his personal story of his long friend and friendship with Allen Ginsberg. He is the only Baul who developed a long friendship with Allen Ginsberg. ​Of course this friendship has it roots in Babu Kishan's Grandfather 'Nabani Das Khyepa Baul'who was an Avadhuta that Ginsberg met on his trip to India in '1962' and whom he kept a personal and private connection all his life. You can see Babu Kishan's link on Allen Ginsbergs Page under links, miscellany. Babu and Allen are both poets and they were mystical friends. "We also are indebted to the influence of Allen Ginsberg, who met Nabani Das in the early 1960s and wrote “Indian Journals” and never wavered from his spiritual path; to Albert B. Grossman who brought Nabani’s sons Purna and Luxman Das Baul with their group to the US in 1967 to record for Elektra Records and tour; "
​"Albert Bernard Grossman (May 21, 1926 – January 25, 1986) was an American entrepreneur and manager in the American folk music scene and rock and roll. He was famous as the manager of many of the most popular and successful performers of folk and folk-rock music, including Bob Dylan, Janis Joplin, Peter, Paul and Mary, the Band, Odetta, Gordon Lightfoot and Ian & Sylvia." It should be noted that it was Allen Ginsberg who wanted to bring Nabani Das Khyepa Baul to America but he refused, thus he sent his two son's, Laxshman Das Baul and Purna Das Baul and their band. This is the only Baul Poetry Allen Ginsberg wrote. Babukishan composed the music for the original in collaboration with Garth Hudson, Robbie Robertson, Levon Helm, (of The Band) Bob Dylan's Band in 1985 for the tour. This is the one and only piece of Baul poetry Ginsberg wrote. Babu Kishan sang this on 40 city American tour with Bob Dylan and the Band. Babu became great friends with The Band and jammed with them all the time. 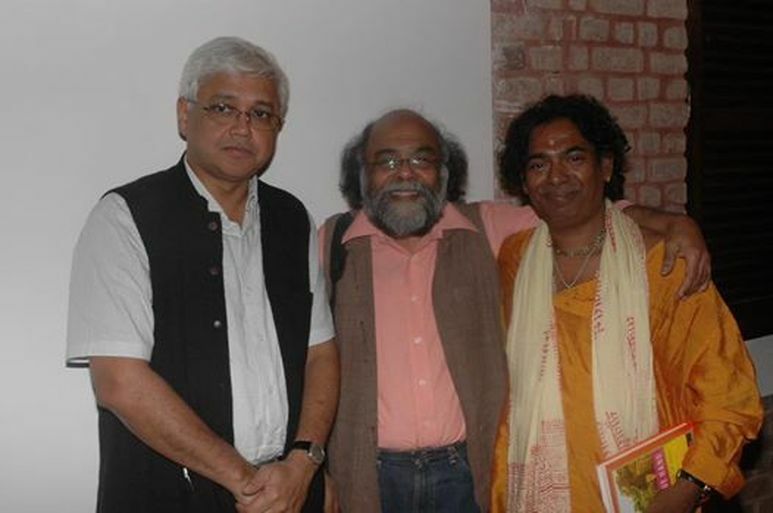 Long time friend of Babu Kishan's, Author Amitav Ghosh who is Deborah Bakers husband and Prabodh Parik a famed Gujurati Poet & Babu Kishan 2008 Mumbai @ the launch of "The Blue Hand." a book about Allen Ginsberg. "A spectacular multicultural music jam featuring American master musician David Amram and a Bengali Baul from India, Babukishan Das, will highlight a booksigning party at New York's Bowery Poetry Club to celebrate the publication of BOB DYLAN AND THE BEATLES, VOLUME ONE OF THE BEST OF THE BLACKLISTED JOURNALIST. 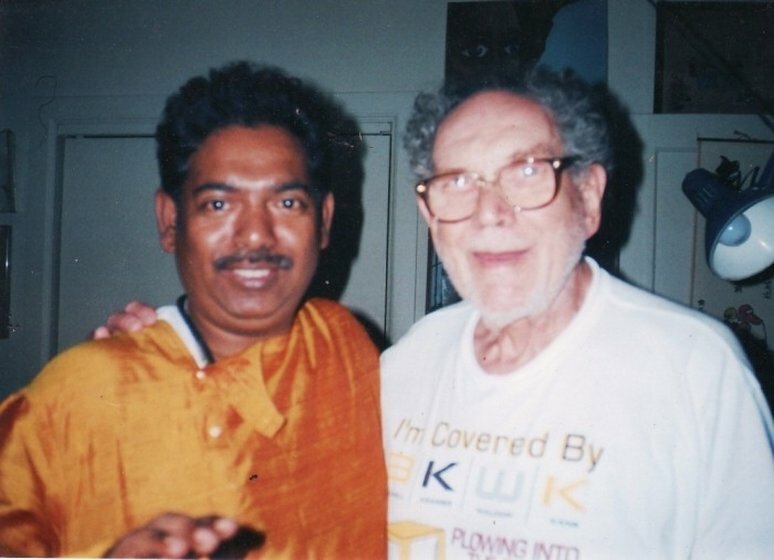 Babu Kishan was a long time friend of Al Aronowitz, Al called Babu Kishan 'a Sizzling Baul'. Bob Dylan, the Beatles, Mick Jagger, Brian Jones, Jimi Hendrix, Allen Ginsberg, Jack Kerouac, Neal Cassady, Michael McClure, Jerry Garcia, Phil Spector, Janis Joplin, Bobby Darin, Jane Fonda, Marilyn Monroe, Frank Sinatra, Brigitte Bardot, Elizabeth Taylor, Paul Newman, Barbara Streisand, William Carlos Williams, William Burroughs, Ernest Hemingway, Ray Charles, Miles Davis, Billie Holiday, Dizzy Gillespie, Louis Armstrong, Duke Ellington, Carole King, Gerry Goffin, David Bowie, Peter Townsend, The Band, Merle Haggard, Charlie Pride, Johnny Cash, Steve Allen and ad infinitum. "The '60s wouldn't have been the same without me." 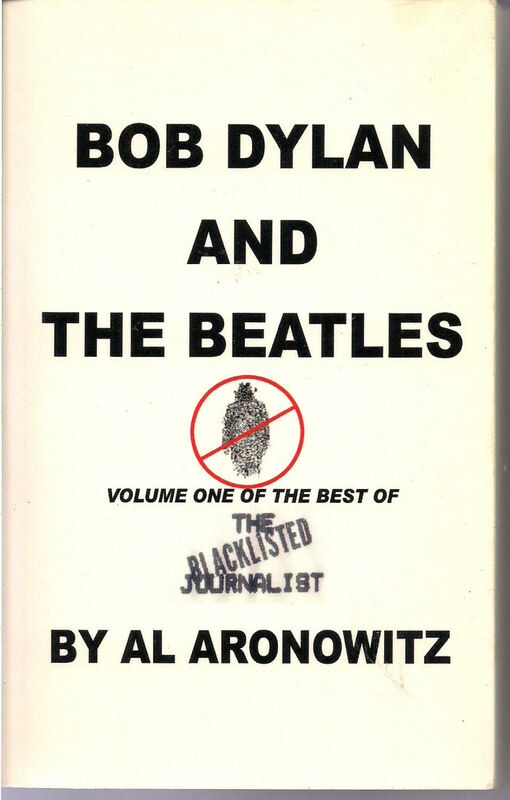 The book contains first-hand descriptions of meetings between Dylan and the Beatles that no other writer can describe because no other writer was there at the time. Also participating in the music jam will be jazz saxophonist Hayes Greenfield; Chicago blues guitarist Ladell McLin; Jazz Foundation president Wendy Oxenhorn on harmonica; Kevin Twigg on drums and John DeWitt on bass. Babukishan Das, familiarly known as Babu, is the son of the celebrated Bengali Baul. 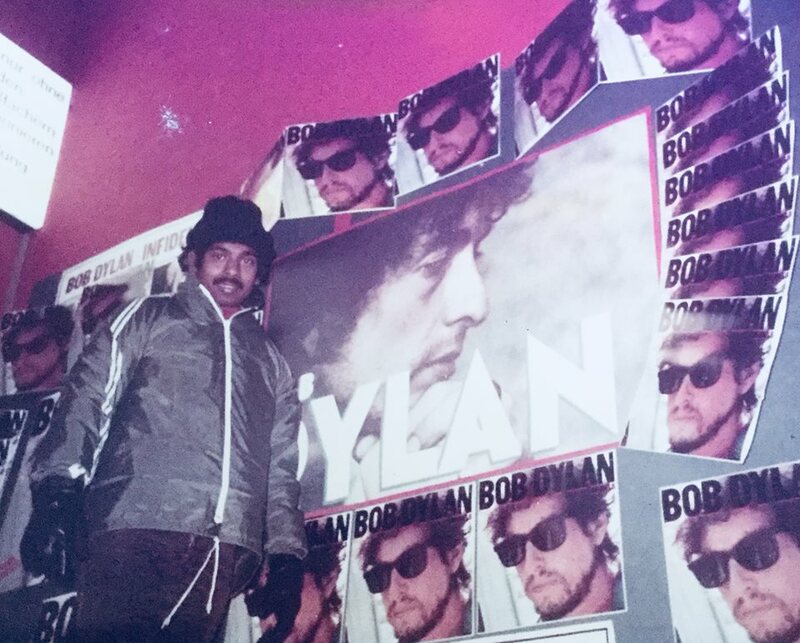 Purna Das, whom Dylan introduced to American audiences by posing with Purna for the cover of Dylan's "John Wesley Harding" album. Purna's son, Babu, who has a hit recording on India's pop charts, has made a name for himself by writing scores for many of the films streaming out of India's film capital, known for some reason as Bollywood. ​"India is becoming Bob Dylan and Bob Dylan is becoming Baul." David Amram, described by the Boston Globe as "the Renaissance man of American music," has also composed scores for films, including "Splendor in the Grass" and "The Manchurian Candidate." In addition, he has composed more than 100 orchestral and chamber works, written two operas and appears as guest conductor and soloist with major orchestras around the world. He has also toured internationally with his jazz quartet." well, i won't buy this one! Levon Helm famous American Drummer and Vocalist of 'The Band' who was Bob Dylan's original Band. An old picture of a young Babu Kishan at Bob Dylan's home in Woodstock, early 1980's. When Babu Kishan worked for CBS India 1986 - 1993 he released, marketed and promoted all Bob Dylan's Albums in India. Babu Kishan has personally known Bob Dylan and if it not for Babu Kishan who was a super fan and his encouraging RV PANDIT to release all Bob Dylan's albums in India, no one in India would have known who Bob Dylan is in India in the 1980 and 1990's. It was due to Babu Kishan that the people of India were able to know Bob Dylan. Babu tried to bring Bob Dylan to India between 1986 to 1993 while he was the A/R Manager at CBS India, however, and unfortunately in those days very few people in India knew who Bob Dylan was. Unfortunately Babu Kishan aka Krishnendu Das could not get sponsorship for the concert, he tried over many years by promoting and marketing Bob Dylan to India. It is a curious matter some in Bengal and even more curious that Bangladeshi Bauls claim to know Bob Dylan??? No no they do not! Now all claiming that all of the Bauls are associated with Bob Dylan, this is not true. Babu's father and uncle initially met Dylan at the BiG Pink in 1967 in Woodstock, no other Bauls in Bengal or Bangladesh ever had anything to do with Bob Dylan. After 18 years Babu Kishan through his travels to America on his own met Al Aronowitz, George Harrison, Allen Ginsberg, The Band (Levon Helm) and others who associated with Bob Dylan, it was during this time period that he developed a relationship with Dylan. Babu Kishan became good friends with all because of his musical ability not because of being a Baul. 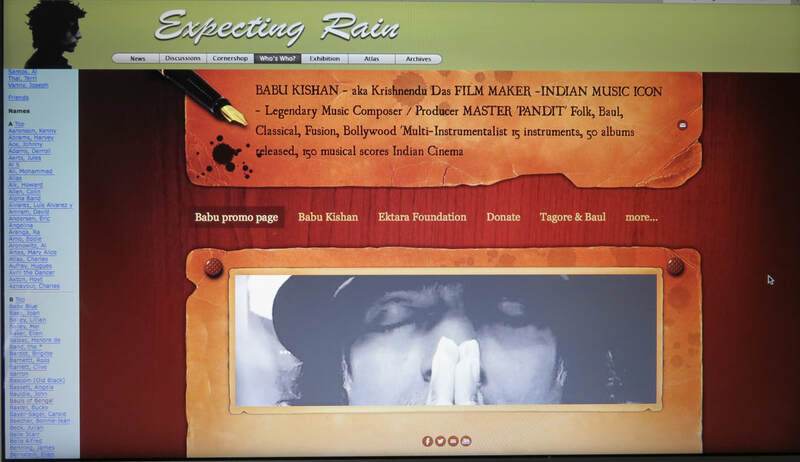 Babu Kishan is a Master of India Classical, Folk, Baul and Bollywood (Indian Cinema) music. He has a Masters degree and has composed over 150 music scores, please see his resume. He is not just a regular Baul, he is a Master of Indian Music and he composed all of his father's music. 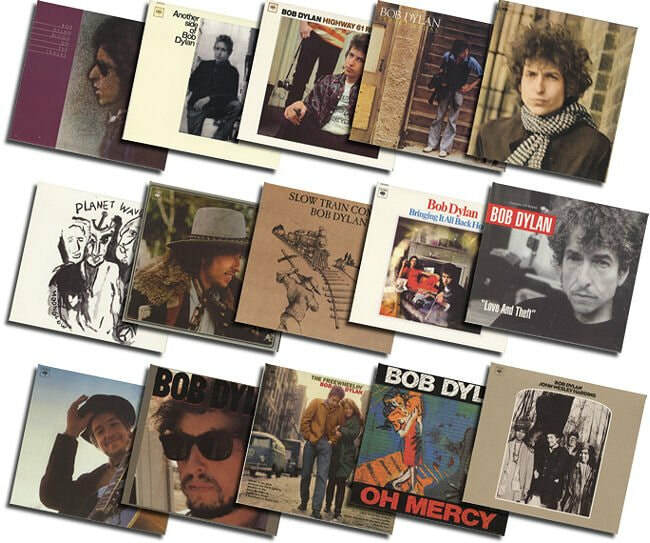 Babu is the only Baul that is associated with Dylan other than initially his father and uncle who met him Woodstock USA and they are on the cover of Bob Dylans album 'John Westley Harding'. Bob Dylan never went to a wedding in Calcutta secretly or otherwise in 1990, he was on a 'Never Ending Tour' that took him to Brazil in 'January of 1990' when the wedding took place and as far away from India that one can get. In 1990 Bob Dylan he was in Brazil, Europe, Canada and then to the USA . Dylan did 93 concerts in 1990. Dylan did not teleport to Calcutta for 2 hours and if you know India, just imagine flying to Delhi or Bombay in 1990 for your first trip to India. Then because Calcutta did not have an International Airport catching another airplane flying to Calcutta for a secret wedding of a person you did not know? Dylan would have done this without telling the person who managed his records in India, a person who had been trying to bring you to India and then secretly behind that persons back attending that person own brother's wedding who you didn't even know without ever saying a work?? There was one white guy wearing a Red Kurta from California but he was not Bob Dylan?? Babu's middle brother who married the younger brother and his wife was there 24/7 he says there is no way Bob Dylan was there. A fabricated story that has become fake news, reported over and over. Sorry folks. The news of Dylan in India is fake news and it has been confirmed from many sources. Including Bob Dylan's own son Jacob Dylan whom Babu chatted with just this past August, he said there is no way my Dad has ever been to India, never ever. The first person that would have known if Bob Dylan came to India would have been Babu Kishan because he was in close contact with him trying to bring him to India in 1990 unfortunately, it did not happen. Babu Kishan was the only person who had any private contact information for Bob Dylan's and he did not send an wedding invite to his brothers wedding. Those in Calcutta did not even have any contact with Bob Dylan. Dylan did not know who Babu's younger brother was and the father never called anybody, that was Babu Kishan's job he kept all the contacts with him in Bombay. I have no idea why Journalists do not dig deeper, why they believe one or two sources who obviously have an agenda. Why speak out, because it is a huge embarrassment when you know the truth and others (media) just copy and paste from one source without even investigating. Journalism used to be investigative today it is just copy and paste. There is a simple remedy to this interview the people involved. Interview Bob Dylan first! Interview Babu Kishan who you probably didn't know was the guy in charge of Dylan in India and that shows a lack of journalist skills, interview the middle brother who married the fools, and look at Bob Dylan's tour schedule? Music Producer, Creative Director India, promoter, of artist such as Cindy Lauper, Micheal Jackson, New Kids, Bob Dylan on the Block, Pink Floyd, Gypsy Kings and many others. 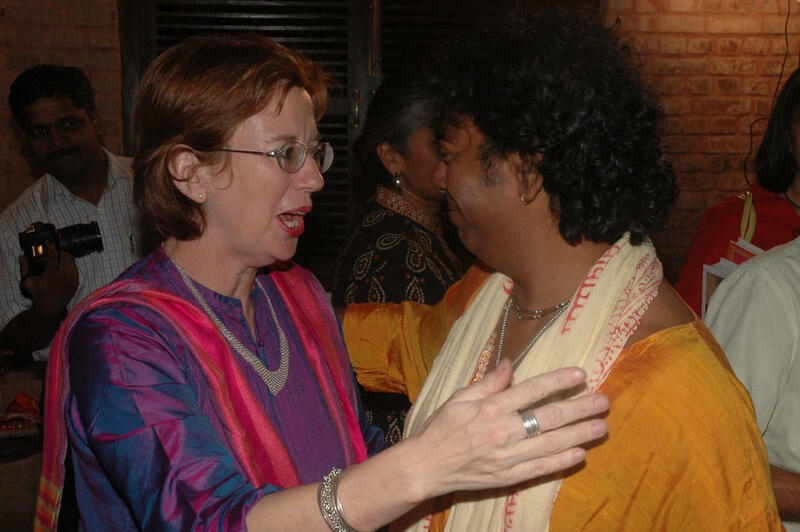 Babu Kishan arranged with Bob Dylan to go on his Tour of America in the 1980's and Babu brought along his Father and Mother along as the Bauls of Bengal. Everything Babu did was always with the thought of his 'Fathers career as he was his fathers manager and arranged all his tours and travels up until 1991, he worked for his father for over 20 years' and started traveling with his father in 1971. His thought was how can I help my father always on his mind, his own career took a back seat. Anybody, who knew Babu knew how he sacrificed his own career for his parents. They performed with Bob Dylan approximately ten times all over America in the mid 80's due to Babu Kishan arranging the tour, it was arranged through Babu's friendship with Bob Dylan. Babu Kishan's link on Bob Dylan's - Who is Who? The 3rd book Babu Kishan wrote on the Bauls of Bengal. 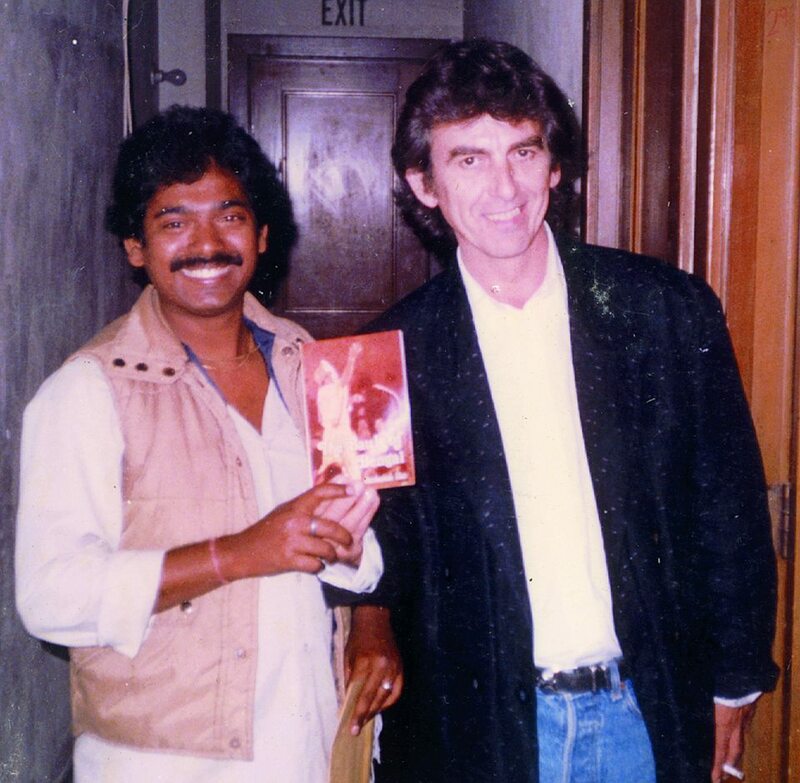 This photo was taken at an event George Harrison did for Babu Kishan, book sponsored by George Harrison. 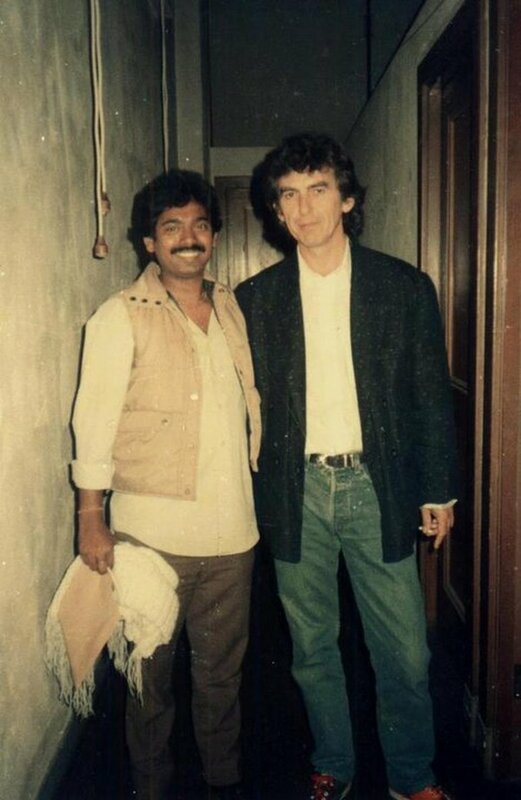 1986 LA California Babu Kishan with his friend George Harrison, it was Harrison and Shankar who release Babu Kishan's 3rd book on Baul. It is interesting to note Tom Petty was at this event staying over to the side. Babu met George Harrison through Ravi Shankar. Ravi Shankar was the most influential India person in George Harrison's life. He met other Guru's but Ravi was his best friend. George Harrison is the first person to promote Indian Music, Kirtan outside of the world. He really was a rare and sweet man. Babu will write about his experience with George in his upcoming book. We are #Human and we make mistake sometimes, it’s can be #forgiven but we never forgotten. A incident happened in my life which I will never forget. George Harrison arranged a book signing event for my last book in 1988 in which Tom Petty was there. Petty had completely changed his hair and style and I could not even recognize him, today looking back I feel foolish because I could not recognize him, he is was famous at the time a true Rock Legend, I could not recognize him. When my #Book was released in #LosAngeles 1988 by George Harrison of the Beattles and by #IndianClassicanMaestro #PanditRaviShankar there was a person who came backstage and trying to talk to me, I felt disturbed he trying to get my attention and was trying to tell me something, but I thought he a random and came from the audience. I was so busy I just thought he was some person and I didn’t recognize him and stupidly I totally ignored him. Tom Petty (who I did not recongnize) started talking with GeorgeHarrison, we all thought maybe they know each other. A student from UCLA took a video of the of the Book releasing event, just a quick shot with Tom Petty in it, so he was noticed by others. Ravi Shankar’s Manager (HariHara Rao) who was a great friend he worked at #Ethnomusicology dept of #UCLA was Indian born American, also a #Tabla & #Sitar player told me, "Babu you were avoiding the guy on stage and backstage, he was the person you knew from long time, it was Tom Petty and he just came to say hello and was there to wish you well’. Harihar said to me, "Babu that was Tom Petty, your friend from the circle that you used to jam and hang with in the late 1970’s and 1980’s #AllenGinsberg, #BobDylan, #TheBand and George Harrison". I used to jam with him all the time in Woodstock NY me being Indian these were my friends. After that incident I never met again saw Tom Petty in person but we talked on phone. ☎️Obviously I apologized lots, I said I was sorry, I couldn’t recognize your looks had totally changed. 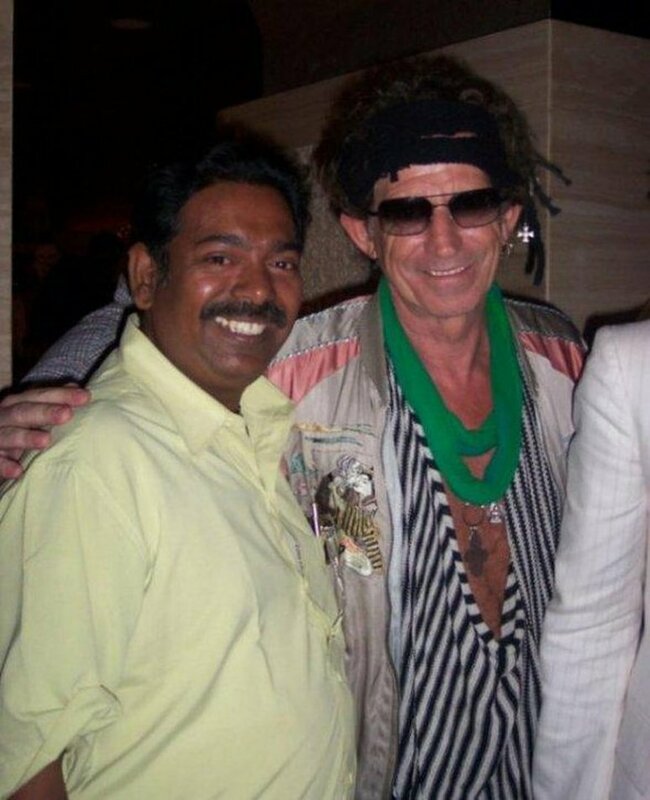 Babu Kishan brought Jackie Schroff (Bollywood's Top Actor) to meet the Rolling Stones (2004) in Mumbai. 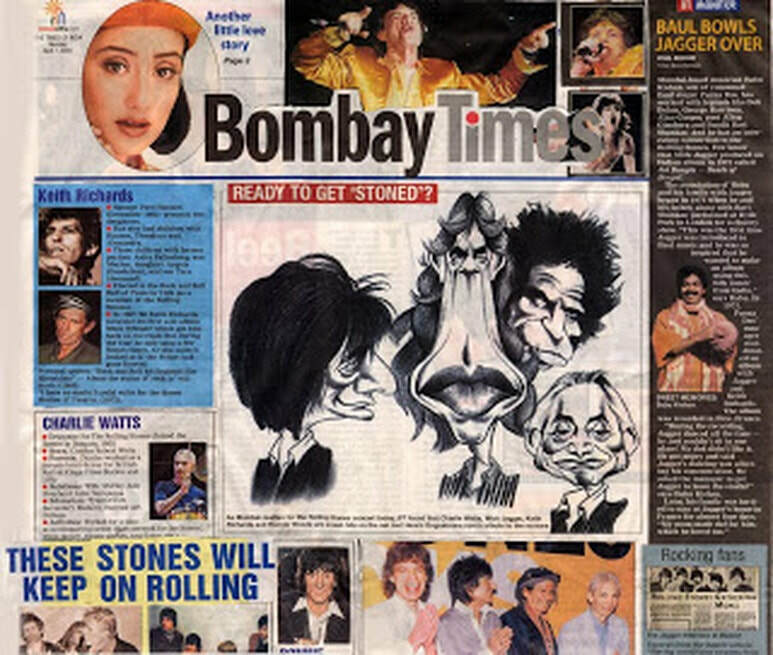 Babu Kishan brought Shah Ru Khan, Tata, Shobhade, Parameshwar Godrej,Pritish Nandi and other he introduced to the Rolling Stones. Babu is a drummer and percusionist. 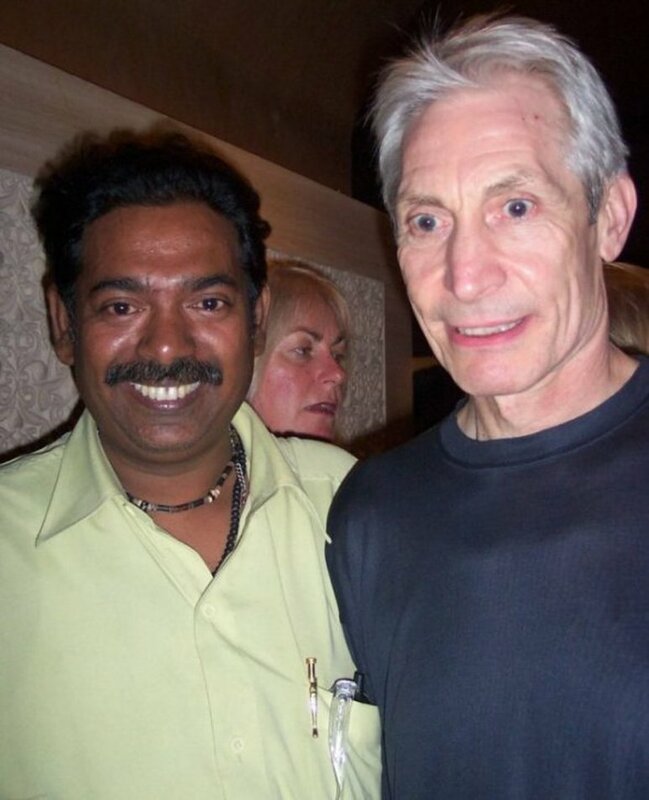 this Photo in 2004 Mumbai when the Rolling Stones came to India. However, Babu knows Tim from Manhattan as a musician and friend. 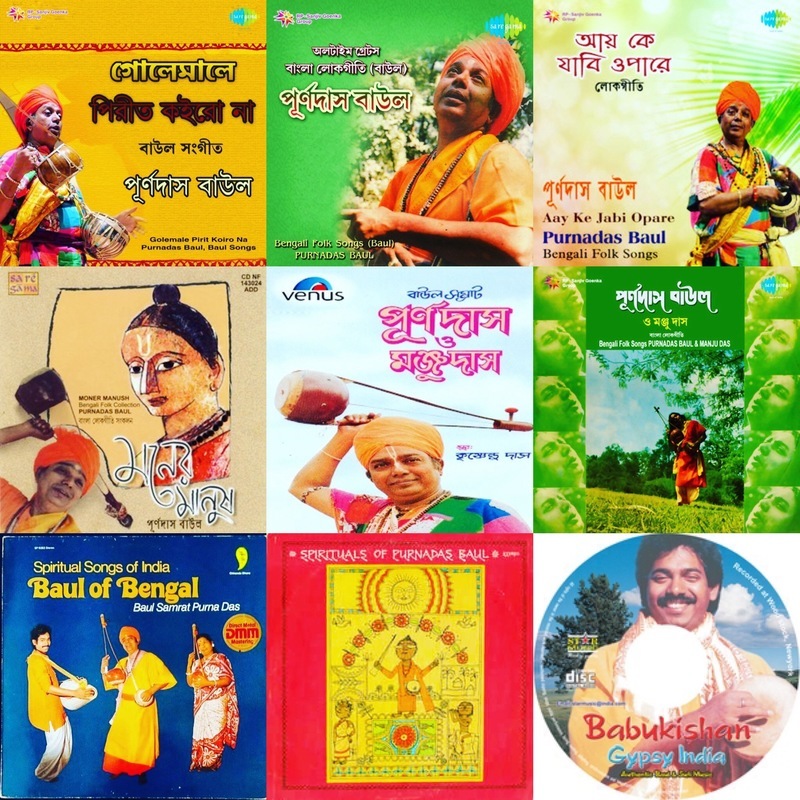 Krishnendu Das aka Babu composed music his whole life, a inborn Mystic and Poet. He was awarded, "The youngest Music Composer" in the 1970's when he was not even a teenager. Sri Nabani Das Khyapa Baul, the Legendary last authentic Baul of Bhirbhum Bengal, the Baul who initiated Rabindranath Tagore into Baul giving him the name Ravi Baul. Nabani Das Khyapa Baul is Babu Kishan's grandfather and Guru he raised Babu until he was 8. Allen Ginsberg met Nabani on his travels to Bengal in 1962 and tried to bring him to America in 1967. Nabani refused but sent his two sons Laxshman Das Baul and Purna Das Baul, you must remember they spoke very little English. Babu bonded with Nabani Das Khyapa Baul as if he was his father, he is his first music teacher along with his Nabani's wife and Babu's Grandmother Brajabala Dasi. 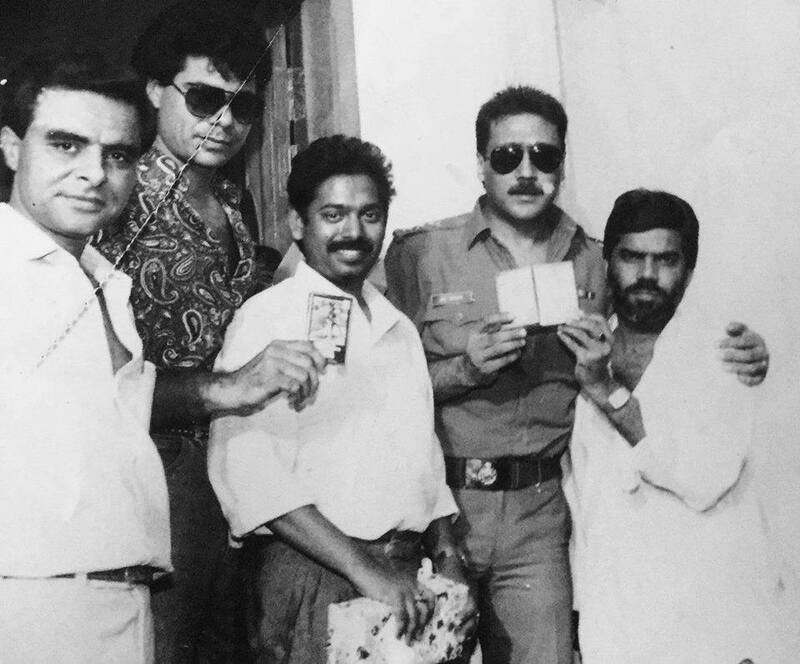 Babu Kishan's Indian Cinema (Bollywood) Guru and a great friend (left), he spent 13 years as RD Burman's (far right with glasses) assistant. Today we have instant Bollywood music directors! Babu stuck with RD Burman through his difficult times and knew and his father from Bengal way before Bombay. RD Burman's father (SD Burman) was a fan of Nabani Das Khyapa Baul (Babu's Grandfather). ​Music Producer and Composer with them. This is a Babu Kishan album. Krishnendu Das aka Babukishan Baul, the son of Baul samrat, Purna Das Baul and grandson of legendary Nabani Das Baul was here, in our city for a poetry book launch While he keeps his audience in his thrall with his powerhouse rendition of Baul earthy singing and dancing, the foot can't help but tap; synchronising with every pluck of the 'Ektara' string; the mind can't help but drift away into the rustic village interiors. At a tender age of four, a realisation came to Krishnendu that he is going to become a Baul like his father and grandfather and keep the centuries old family tradition alive. He even started touring the country and gradually began to touch foreign shores with his father, for his musical repertoires. Says Babukishan Baul," We are the messengers of peace. We wander from place to place spreading the message of divine love and universal brotherhood. We worship the soul. Every soul is beautiful as God lies in every individual." Even though it seems like it is entrenched in Hindu tradition, the Baul philosophy transcends all religions. It believes in free-thinking. "We borrow ideas and ideologies from Islam, Buddhism, Christianity and several other ancient religions. Nobel Laureate Rabindranath Tagore himself, rock musicians, poets and artists have drawn inspiration from Baul music and philosophies. Babu's professional career in music began with some of the 20th century's greatest musician's. He toured with Bob Dylan's The Band in their 1985 East and West tour. He has performed and recorded with the likes of George Harrison, Rolling Stones, Beach Boys, Chakka Khan, Ravi Shankar, Zakir Hussain, Tom Petty, Miles Davis, Allan Fakir, Herbie Mann, Third World, Robbie Robertson, Garth Hudson, Ziggy Marley, R D Burman, and many others. ​The Beat poet Alen Ginsberg had exclaimed after listening to Baul music, "I have finally found what I was looking for!" And where does a Baul draw his inspiration from? "We look within. We search our souls and find the answers. The deepest and the most profound secrets are lying in our hearts, which can be unearthed only by means of meditation and staying in touch with our core," says Babukishan. The Baul's ideology is symbolised as the 'Ektara' - the one stringed instrument, connotes "to unite'. As the line goes "…deshey deshey more ghor acchey…" (I have a home in every land), a Baul wears a multicoloured attire, called 'Guduri', made up of cloth swatches stitched together, picked up from every place, every land he visits, representing the multicoloured nature of human society with all its shades. The maverick musician, Babukishan knows how to play about 15 different instruments and can even make many with his own hands. He was the first to make Baul Fusion music collaborating with international acts like Beach Boys, Bob Dylan and The Band, Ziggy Marley in the late seventies and eighties. . However, he was subjected to a lot of criticisms from the purists. Says Babu, many fakes have come out. But a true Baul is the one who can tell a profound philosophy in the first few lines of his/her song, then breaks into crooning the lines of the poet Rashoraj Goshai, " Amar jemon beni temni robey, chul bhejabo na' ( I shall dip into the water, yet not let my braid get wet in it), which means, I shall be a part of the world and enjoy every bit of pleasure it can give, yet be detached from it. Most women have been 'Grihi' (one who stays indoors) Baul, like his grandmother, Brojobala Dashi, has also contributed to this kind of music and their support has been monumental in Baul music. Besides, women are considered to be the source of inspiration and strength. Says Babukishan, "We believe that every human being has aspects of man and woman inside him or her. That's why we keep long hair." With the opening up of the economy and globalisation, Baul music has received acceptance abroad, but not as much in India, although our nation is getting westernized at jet-speed. Says Babukishan who gives lectures at several universities in the USA, Canada, Europe, South East Asia, etc, "The latest culture to hit the youth is the 'mall culture'. They are seeing fifty thousand things around them, but cannot set their hearts upon what they want." The legendary Bob Dylan had once said to him "India is becoming Bob Dylan and Bob Dylan is becoming Baul." So what is freedom to a Baul? "Freedom to me is boundless, it means to be able to do whatever I want, go wherever I want to go, say whatever I want to say. I will feel free and liberated when I find my 'moner manush' my soul mate. Till that time, I will keep on searching it." Babukishan wants to start an institution called, The Bauls of Bengal Academy of Folk Performing Arts, to help preserve this ancient lineage. "We are looking for a platform and finances. The institute will be devoted to the pursuit of learning Baul music, Vedic healing and Music Therapy," says the Baul, who has immense faith in power of mass media. Only it can change the way the world thinks, as Baul has been the oldest medium, wandering from place to place, telling stories, exchanging philosophies and ideas. Baul origin: The word Baul (pronounced: baa-ul) derived from the Sanskrit word 'vyatul' meaning 'insanity'. Bauls of Bengal can be traced back to the 16th century to the advent of Vaishnava spriritual leader Chaitanya Deva (1486-1533). The mystic Bengal Baul sect constitutes, performing Kirtan, Bhajan and Baul songs. They were minstrels who wandered the streets of Birbhum (famous for Nobel Laureate Rabindranath Tagore's education institution, Shantiniketan), sleeping under trees and singing and dancing for a livelihood. The Bauls have their own philosophy, a mix of Hindu, Islam, Buddhist and Tantra. Like the Sufis, they strive to bridge the rift that was created between the religious and social groups, professing freedom from compulsion, doctrine and social caste. 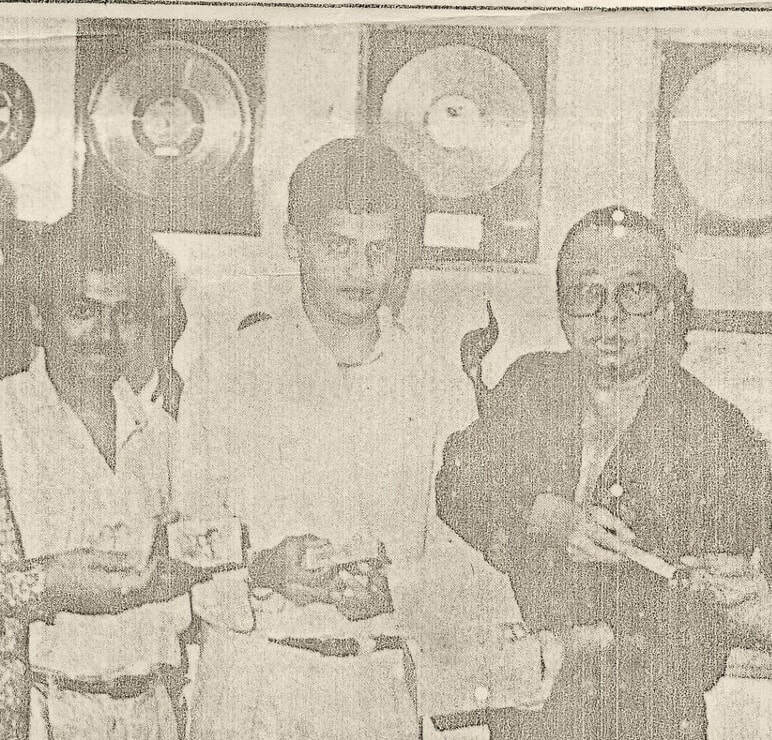 Earlier years recording in Mumbai, 1980's, Quality Control, Cassette Production, Master to Audio Video Cassette Factory. Babu Kishan looking on back in the day before the digital world of today. Gramophone Company. Babu Kishan and Zakir Hussain with Babu's mom Manju Das at Zakir's house in San Jose California in 1984. 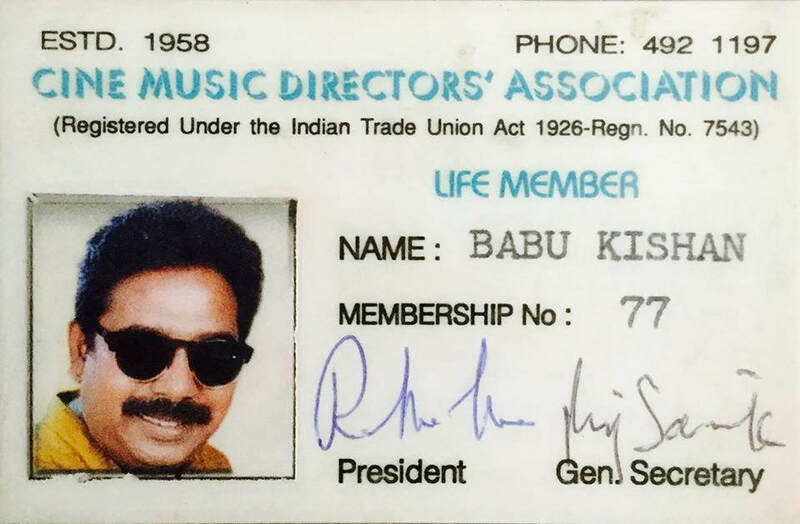 Babu Kishan is still #77 out of 80 Music Composers in India in the 1980's. both legendary names in Indian Cinema and Indian Music Industry. there are over 10,000 back then it was not so easy. You actually had to be a 'Music Composer' and you had to pass an exam. You had to prove yourself to the biggest Music Directors in India and they had to refer you. 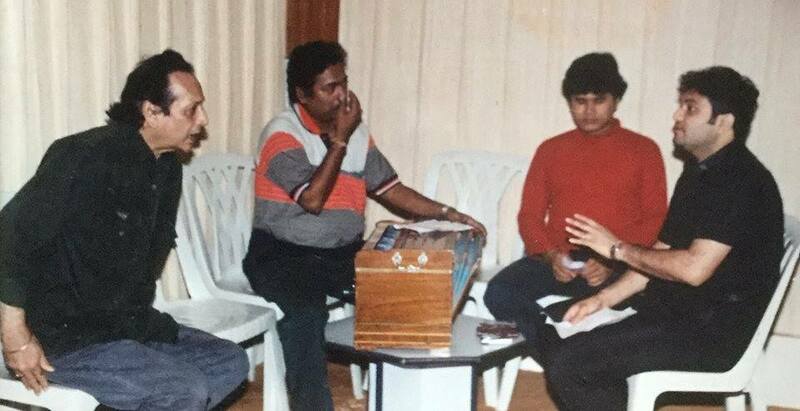 These are a few of the People that Babu Kishan worked with, he Composed music, Produced Music for many and was a Music Director in India Cinema over 40 years in Bollywood and later Bollywood with over 150 musical scores. Babu knew all personally. These photos are not just 'selfie photo opps', he actually worked with each and everyone and more. Most of his photo's have been lost over time. Babu Kishan knew everybody, he never liked to be out front, he worked behind the scenes in India Cinema from a very young age. "I have tried to include links as to who these people are and of course if you are Indian of a certain age you will know them. I do not know who any of these people are, I have had to learn to spell and say their names. I only wanted to know spiritual India but somehow I ended up learning about Indian Cinema too." This is a picture of Govinda and my husband Babu Kishan from when the music for Khudgarz - was released. Babu Kishan released this music and this picture is from that party in Mumbai. This picture was taken by Govinda's brother Kirti. 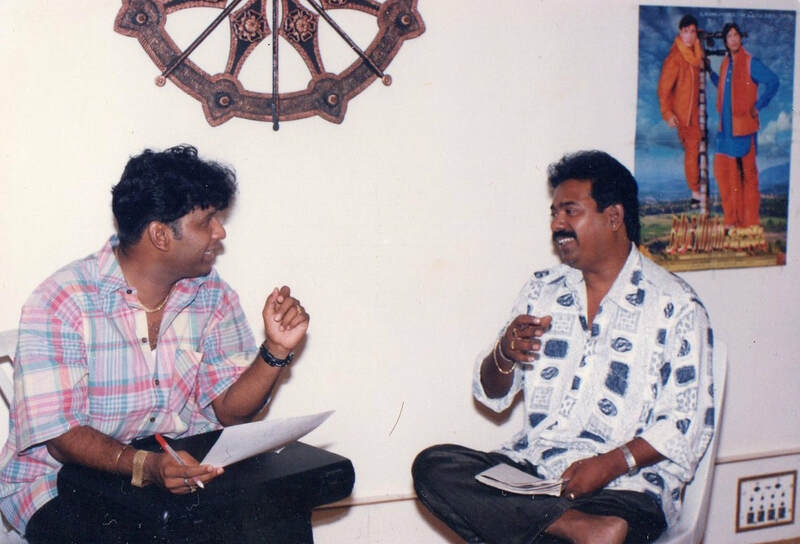 Babu Kishan as Music Composer, recording bollywood singer Vinod Rathod in Mumbai. The most #intelligent and #Intellectual #FolkSinger I ever met in #Bengal!! #DrBhupenHazarika, we were so close to each other with our #Intellectual and #intelligent #artistic #creativity #musical aspects . I Composed and wrote a couple songs for him. Reality Is, Many Popular songs...as composed and many lyrics written by me for my parents and made them a classic status in the #World. They never gave me credit but as you can see the proof is now because of the internet all my recordings and music produced is open and visible for all to see, my work with my father uses my name Krishnendu Das. I am the one who established a great place in The #World #Platform for todays #Bauls and for my father, believe me or not .. but all #silently #dedications and #hardworking behind the scenes, all University lectures done by me because my father could not speak in English. Long long time friend of Babu Kishan's, the book Babu is hold is his last published book and George Harrison and Ravi Shankar gave Babu the book release party for this book. 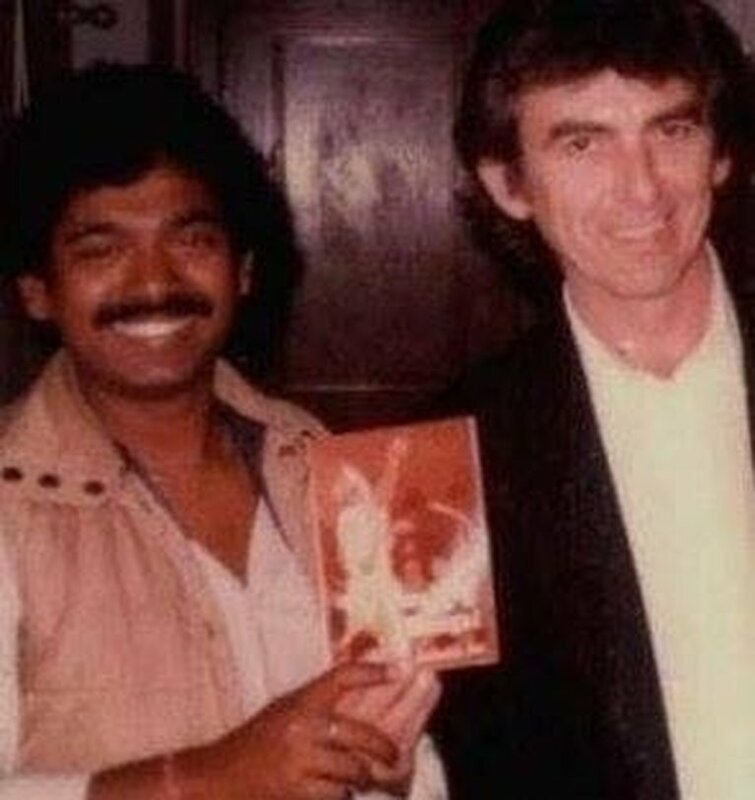 George Harrison supported Babu in producing and launching this book... Jai George Harrison. Chima Ephraim Okorie is a Nigerian former professional football striker who was renowned for his goalscoring prowess in the Indian leagues. 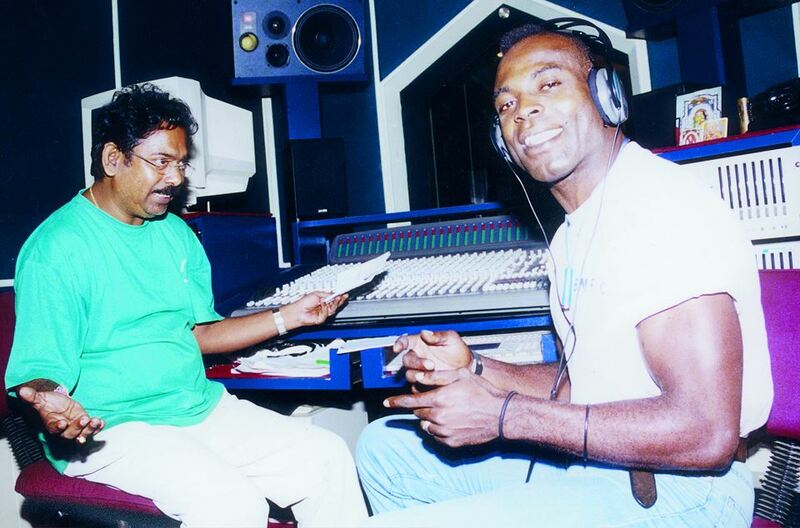 Recording Music with Babu Kishan in Mumbai. He was Babu Kishan's friend and brought him to his family in Calcutta that is the only reason some of them have photo's with him. Babu was working with him. Babu Kishan with Satyajit Ray (The Father of Indian Cinema). Babu sitting above his neck with a big smile on his face. Satyajit Ray was a great friends with Babukishan's Grandfather BaulAvadhuta Naboni Das Khyappa Baul and of course he is Babukishan's idol and friend from 1976 to 1992. I Salute 100 years of Indian Cinema and the history Bengal has played in its contribution to Indian Cinema! As a storyteller by ancient tradition and through my real life experiences in Indian Cinema I can tell the real stories of behind the screen, not from the internet, magazines, DVD’s, or from hearsay gossip. I was personally behind the screen for 35 years in Bombay and longer in Calcutta. ​I spent my early years in Bengal’s Cinema Industry, personally working with the people who started Indian Cinema. I have had the kind of experience that can only be told by someone who has been there, done that within the inner circles of the Indian Music and the Indian Cinema Industry. Thus, I start my inaugural, ‘Behind The Screen’ starting with some of my early experiences in Indian Cinema. It was 1976 I was involved in the Bengali Cinema Industry, Satyajit Ray was my icon he was the legendary Godfather of Indian Cinema 1921 - 1992, the great genius creative Film maker of many talents. This story is of my first meeting with him, unfortunately, I never worked with him officially but spent much time with him at his home and on many other occasions. I called him by his nickname ‘Manik Jethu’ at first and then in future meetings I called him Manik Da. When I was a child ‘Pother Pachali’ a Satyajit Ray film inspired me, the story was very much my own life story. I looked exactly like Apu the little boy in Pother Pachali. I started my life in the Bengali village called Suri, in Birbhum, a couple miles from Shantiniketan Bolpur, West Bengal. I was raised by Grandmother Brajabala Dasi and my Grandfather Naboni Das Baul a well known Avadhuta Baul Saint who was best friends with all the poets, musicians and intellectualist like Rabindranath Tagore. I arrived in Calcutta at an early age upon the death of my Grandfather and thus started a whole new chapter of my life. Satyajit Ray was creative in every way I followed him through newspapers, television & radio and I watched him on BBC. He was not only a great Filmmaker but genius in every way, I am always attracted to genius people and I became a huge fan of his and during our friendship and meetings we would discuss everything. The first time I talked to ‘Satyajit Ray’ he shocked me with his big bass voice, I became startled, he said ‘Hello this is Satyajit Ray, I didn’t answer because his voice was so deep and I had fear, “Who’s this”, he said, and I couldn’t answer. I was only a student and he was a huge name, for some reason he scared me so I hung up the phone. Here I was I finally I had obtained his personal phone number from Nimai Ghosh his personal photographer and now I couldn’t talk, my hero the great was Satyajit Ray was on the phone and now I couldn’t talk so hung up the phone. A few months later the Governor General of Bengal invited my family to sing at India’s Independence Day Programme at Raj Bhavan in Calcutta. My family was a well known already famous lineage of musical singer, poets, and storytellers from Bengal. We have been culture representatives of India world wide for at least 50 years. My Grandfather Naboni Das Baul used to give singing and dance performances before thousands of people with Pandit Jawaharlal Nehru while Nehru gave his public speech in India. Naboni Das was the dance and music teacher of Nehru’s daughter Indira Gandhi at Rabindranath Tagore’s University “Viswabharti” Shantiniketan, West Bengal. My father the world famous ‘King of the Bauls’ also, continued this tradition of doing performances all around India for Indira Gandhi, my parents were close personal friends of Indira Gandhi and I went on many of these hundreds of tours with them. We also did musical performances with Rajiv Gandhi, Sanjay Gandhi and many more politicians in modern India, and I saw a side of India that many people never get to see and can only read mostly about in second hand stories. Back to the story of Satyajit Ray, after the program at the Raj Bhavan there was a huge British style party, back in those days Calcutta still followed the British style. It was only one of the hundreds of these type of gathering I attended throughout India so I was used to meeting all the stars and higher ups in India and this gathering was no different it included all well known Bengalis and others from all over India as I recall some of the people attending were Raj Kapoor, Nargis, Sunil Dutt, Dilip Kumar, S D Burman, R D Burman, Biswajit, Uttom Kumar, Suchitra Sen, Aparna Sen, Dulal Guha, Shakti Samanta, Hrisikesh Mukherjee, Amitabh Bachchan, Rajesh Khanna, Ravindra Jain, Kishore Kumar, Lata Mangeshkar, Pramod Chaki, Salil Chowdhury, Asit Sen, Komal Bose, Soumendra Roy, Bansi Chandra Gupta, Footballer Shyam Thappa, P K Banerjee, Ravi Shankar. They were the who is who of the 1970’s. Master Film maker Mrinal Sen, who was like a family friend said to me, “hey Babu, how are you doing, are you doing anything new these days,” I just stared at him with a blank face, my glance was else where because there in front of my eyes, was Satyajit Ray, my hero he was super duper tall, dark skin with a white kurta, his arms were so long they appeared to hang all the way to his knees. Mrinal Sen then realized my problem I was in awe as he knew how I idolized Satyajit Ray. Right there on the spot he introduced me. Mr. Ray appeared to be 6 feet 7 inches tall and towered over me. 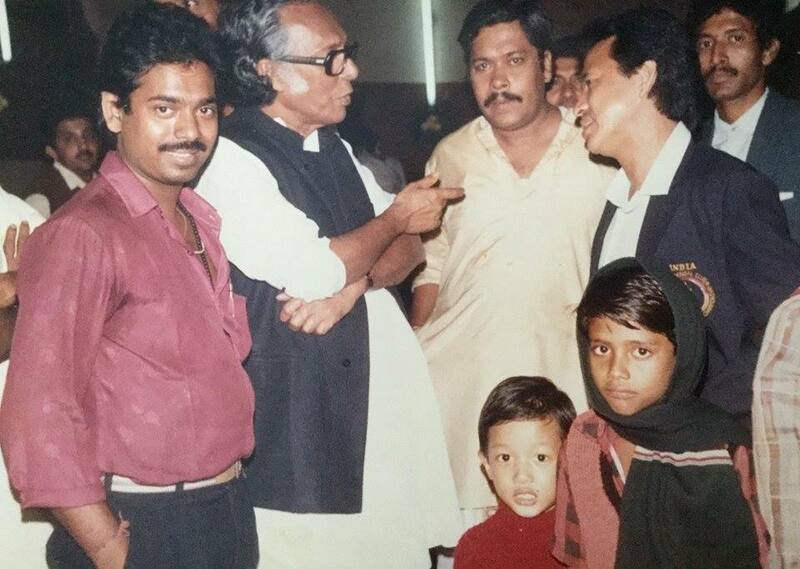 Mrinal Sen immediately introduced me, saying “Manik da (Satyajit Ray), this is Babu, eldest son of our Purna Baul, and thus that was my first meeting with the great Satyajit Ray thanks to Mrinal Sen.
Satyajit Ray said, yes I have read some of Babu’s writing and poetry in my magazine. I was a prolific writer of short stories, poetry and hundreds of Bengali and Hindi songs back in the day. I used to regularly write in ‘Sandesh’, whose editor was none other than Satyajit Ray. I also, was editor for the famous British style Calcutta Coffee House’s ‘Little Magazine’ when I was student of Calcutta University, where I met some of the biggest genius minds of that era. Satyajit Ray then invited me for a morning tea at his house where he lived beside the Hindustan Hotel. Wow, incredible a face to face with the Legend. 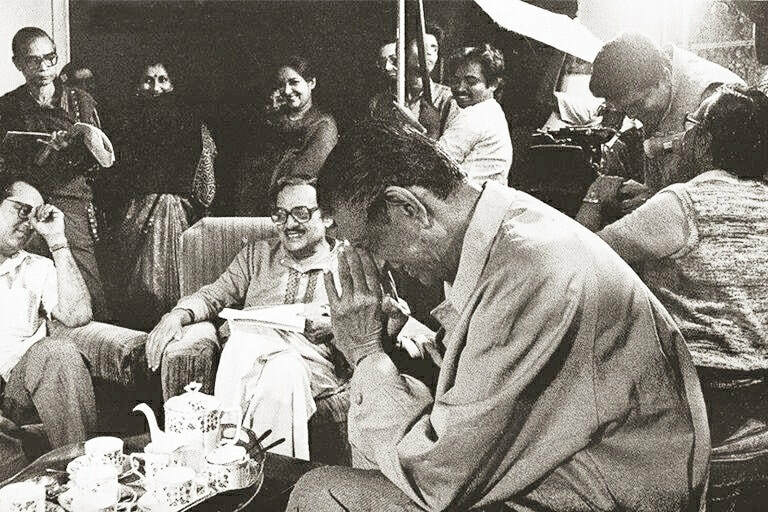 I am used to meeting and hanging around with many of legends but Satyajit Ray’s my dream. He was a superb creative and this meeting was only to have a quick tea but it lasted many hours as we talked about everything along with his wife Vijaya Ray and son Sandeep. I told Satyajit Ray about the day I called and hung up the phone on him and we all laughed, he said to me, “don’t call me jethu anymore I am your Dada as now I was in his shelter and now we can talk as family!! !” This is a name of respect in Bengal and I felt honoured. Every wall in his home was covered with his own paintings, millions of dollars worth of painting done by Satyajit himself, he had huge shelves full of books. He was not only a genius film maker, a great musician, awesome piano player, unbelievable painter, artist, storyteller, he had a great camera sense, location sense, and of course superb sense of setup of characterization in every film that he did. Every film he did became an epic, he was the Director who did not need any stars in his films because he was the star, he knew every angle of film making. I have seen people from all over the world come and only hope to visit with Satyajit Ray. Even Steven Spielberg’s ideal was Satyajit Ray. Most Film Maker’s Ideal is Satyajit Ray, they dream to be like him. Jaya Bhaduri Bachchan tried hard to get work for Amitabh Bachchan early in his career, she tried to get him acting jobs in at least one of Satyajit’s films. However, it never happened because Satyajit Ray said, he did not have any character to fit him at the time. Finally Satyajit used Amitabh’s voice commentary for his controversial film ‘Satranj ki Khilari’, this is when Amitabh worked as medical representative in Calcutta and side by tried many times as a voice commentator for Calcutta Radio Center and failed many times. Oh God Amitabh Bachchan who had the best voice for dialogue deliver ever in Indian Cinema history, and when he became star in film industry, and he is one of my favourite actors when I was in college. 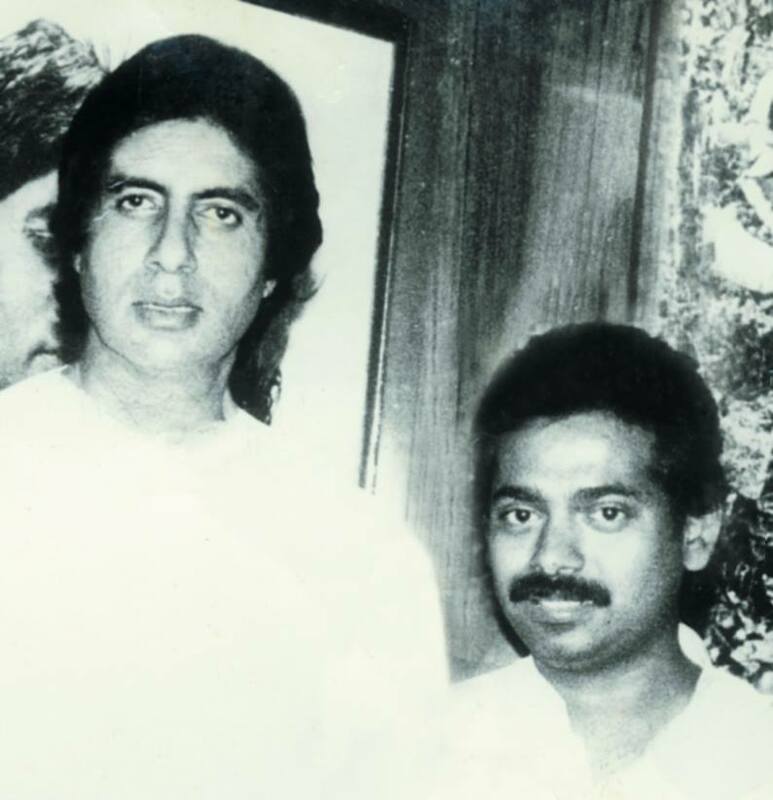 I worked for Amitabh Bachchan as a consultant and promotion manager for his company ABCL in Bombay in the 1990’s and I worked on several film projects with him. The meeting with Satyajit Ray inspired me more towards Indian Cinema. I was already a Writer, Poet, Musician, Composer, and had a name in Bengal from a very early age, in 1976 I already was awarded the Youngest Composer ever in Indian Cinema and had composed award winning music for Bhupen Hazarika, Arti Mukherjee, Shakti Thakur, Banashree Sengupta, Zakir Hussain, Pandit Ravi Shankar and obviously with my parents, Manju Das Baul and Padma Shri Baul Samrat Purna Das. I had already introduced dozens of singers to the Bengal and Bombay film industries. Those were the day when I used to attend Satyajit Ray’s film shoots and music recording, unfortunately, I never tried to get work for myself as my main goal was to get Satyajit to record one of my father’s songs and the funny thing was Satyajit never liked my dad. My dad was famous but had a huge ego as did Satyajit Ray, my dad was Congress and Satyajit Ray was Communist and his best friend was the Communist leader Jyoti Basu, it was sort of complicated because Jyoti Basu’s wife was a fan of my father and friend of my Uncle the now President of India, Pranab Mukherjee who obviously is Congress. By the way my dad did not like my politics either because I was the Leader of Calcutta University’s SFI Student Federation of India which was a communist organization. After my introduction into the world of film making and Satyajit Ray I started my own film making by making a couple of documentaries, and giving them to the National Doordarshan (India’s National TV) to telecast. I was the first Indian independant film maker to film and introduce to the Indian audience to films of Disneyland, Universal Studio’s and many more film documentaries when I was really young, all telecast on Indian National TV. People used to say if you meet Satyajit Ray that means you are in with the completely biggest Indian Cinema, he himself was a film institute and I learned by observation, and through his inspiration. In those days there was very few Indians outside of India, when we used to travel all over the world it felt like we were a rarity in the world. My Dad was the first famed Indian vocalist to travel outside of India starting in the in the 1950’s, he was invited to America in 1967 by the legendary American Beat Poet Allen Ginsberg because Ginsberg loved my Grandfather Naboni Das Baul and Naboni was Ginsberg’s Guru. There are many stories and this is another whole story of historical events of the 1960’s, of my dad jamming and staying at Bob Dylan’s place in Woodstock for 6 months. Poets are always drawn to Poets it does not matter the language it is the soul of poet and the soul of music. It has been said many a times my Dad is the Bob Dylan of Bengal. You can see my Dad and my Uncle on Bob Dylan’s album cover of John Wesley Harding released by Columbia Records in 1967. When Satyajit Ray was dying in 1992 Sophia Loren presented him with the Oscar for Lifetime Achievement at the Academy Awards, he could not attend because he could not travel to America. So it was my very close family friend Dilip Basu who accepted the award for him and brought it from Los Angeles to Calcutta. We worked so hard to make all these arrangements it was a very exciting time, Satyajit Ray had won an Oscar and at the same time it was sad because he could not be there to receive this award. Yes 1976 was a pivotal year for me, it was life changing to say the least. One day my friend Montu Da gave me a guest pass to a Hindi Film Premier, he was the owner of Calcutta’s famous old Cinema Hall called ‘Basushree’ in South Calcutta. The guest pass was for a Hindi film “Do Anjane”, a remake of Uttom Kumar’s Bengali Cinema, this was the first time I attended a Hindi Film Premier. I was already involved with Bengali film, I had composed music for a couple of Bengali films and more than dozen private albums for HMV but had never been to a Hindi Film Premier. Mantu Da introduced me to all the stars some of whom I had met before. It was amazing the public was so hungry to see them all in person as was I. Meeting them talking to them sipping tea, eating Bengali snacks like ujjola’s ’chanachoor’, rasgulla with Amitabh Bachchan, Rekha, Prem Chopra, Mithun Chakraborty was enlightening. I also knew the story writer of that film “Niharanjan Gupta”, Nabendu Ghosh, Editor Bimol Roy, and Director Dulalda who was the one and only well known Dulal Guha. In 1976 the movie Hansaraj was made and released, I had previously in 1974 written and published a cover story about my father’s life in a magazine and Ajit Ganguly the famous Film Director had read my story, he wanted to meet me so he came to my home in South Calcutta, he was searching for something new, a different story for film. Ajit Ganguly was also from Birbhum he had a great love and was a devotee of my Grandfather. Ajit Ganguly had worked with the likes of Uttom Kumar, Utpol Dutt, Aparna Sen and many big names from Bengal. Many great talents were from around my village and were like close family, as was the popular Hindi/Bengali Film Director Shakti Shamanta who directed Rajesh Khanna, Amitabh Bachchan, Rekha, Rakhi and many more. Shakti Shamanta was from next to Birbhum in Burdwan District and he started off as a simple primary school teacher, he was another legendary Film Director/Producer of Indian Cinema. Therefore, we knew them all personally and they regular guest at my family home. Ajit Ganguly came to my house signed my story, the story I had written of my father’s life and Ganguly made a movie using my story. He gave me a small signing amount for my story, and gave me a pen and told to keep writing, we talked continuously for days, including my father in the discussions. Ajit Ganguly made history with this Bengali film Hansaraj in sales, I was so proud it was the story of my fathers life from the village to Calcutta, ‘Hansraj’ the life of Purna Das Baul. The film was a huge commercial success and opened the Bengali Film market to new actors. Bombay’s Rajshri one of the leading Indian film distributor, owner of 100’s of cinema halls and famous for their ability to introduce new actors, they were introducing stars like Salman Khan, Amal Palekar, Mithun Charkaborty, Madhri Dixit. Rajshri also, bought the rights to my story and made a film with new faces, the film was called ‘Sawan ko Ane Do’. The conditions I stipulated was that my father would be the Music Composer, my father is not a music composer, but I am I would compose the music for my father and give his name because back then it was all about my father, I did everything for him and his name. I did this many times for many famous films and some people thought I had lost my mind why was I composing music and putting my fathers name on my work? I am a trained Hindustani Classical, and Modern music and Folk and Baul music is in my blood they are my soul. I was raised with the biggest names in music and have a Masters degree in Indian Music. Anyhow, because of circumstances we did not do the music for the movie, I was disappointed and there was nothing I could do at the time because we had gone on tour to Australia. To be fair Rajshri Production’s owner Tarachand Barjatya waited for us but in the end Raj Komal did the music composition the leading roles were played by Arun Govil and Zarina Wahab ( Suraj Pancholi’s Mom, Suraj is the controversial boyfriend of the recently late Jiah Khan). 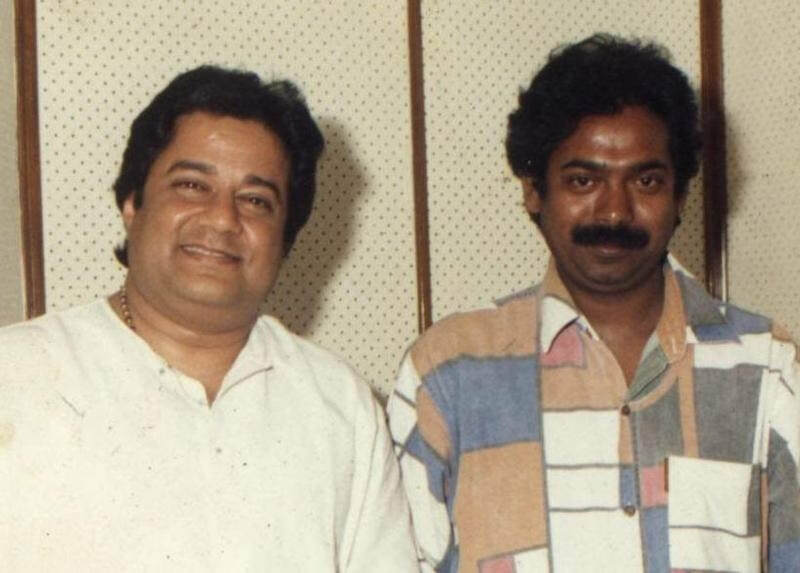 Later in my life I did work with Rajshri Productions, composing many albums and doing a lot of background music for film, I also was a consultant for the Rajshri’s music division. One of my greatest works as a music design consultant for them was Salman Khan’s first film, Maine Pyar Kiya. Indian Cinema started in Calcutta, it was India’s Capital before independence, and Calcutta’s port was India’s number one Port City, after the British occupied Calcutta it was developed to look like a second London and Bengalis became their right hand making some in Bengal half British. The British found Bengalis to be intelligent, trustworthy, politically strong, artistic, educated and they used the Bengalis to keep their foundation alive through their control. The British started cultural activities like night club, opera, theatre, classical concerts side by side with the Bengalis involvement. Bengal was called India’s ‘land of culture’ and birth of Indian Cinema!!! ‘New theatres’ start up was everywhere . The people worked and became legendary including Bimal Roy, Nitin Bose, S Mukherji, Tara Chand Barjatya, Dada Shaheb Phalke, Prithiraj Kapoor, Timir Boron, Pankoj Mallick, Rai Chand Boral, Promotesh Barua, Kanonbala, Pahari Sanyal, Hiralal many more....then Bombay Talkies in Bombay. Dada Saheb Phalke worked in Calcutta and became a very prominent name in Hindi but his soul is in Marathi Film. At that time the technicians and musician were almost all from Bengal. Bimal Roy was the one of the Big Boss’s of Indian Cinema. He was the guy who changed Indian Cinema’s scenario, he worked in both places, Calcutta and Bombay. ‘New Theatres (P) Ltd’ in Calcutta and the starting from ‘Bombay talkies’ as writer, editor, director and producer. I know Bimal Roy well and his family, his son Joy Roy was my best friend. Most people do not know this by Ali Akbar Khan and his sweet sister Annapurna's father 'Baba Allauddin Khan' (1862 – 6 September 1972) were the greatest admirers of Babu Kishan's Grandfather ' Baba Nabani Das Khyapa Baul'. 1895 - 1969). Allauddin Khan was one of the first Indian Classical multi instrumentalist, he played Sitar, Sarod, Tabla, Harmonium, Flute, Sarangi, Shenai and more. He was a very mystical person and a Music Composer a beloved family friend to Babu Kishan's family. One time he asked Nabani, 'can I take your Ektara because it is magical and when you play you take me to some other world". Nabani said, "I can give you anything but not my Ektara because that is my first love". Somehow, somewhere Allauddin touched and played Nabani's Ekatar and felt the mystical vibration and said he found thousands of stories, lyrics, mystical vibrations and said, Nabani is a complete musician and a mystic sadhaka and found he now had a mystical Sadhaka friend. He felt Nabani's smile was unlimited worth the world. A musicals persons first love is their instrument. Nabani promised to make him another Ektara and gave it to Allaudin but he refused because he wanted Nabanis Ektara because it had a vibration that shocked him to the core. The Das family home became a Musical Cultural Cinema Political and Guru Hub in Calcutta. This started with Nabani Das Khyapa Baul who many great poets, authors, Music Composers, Singers, Gurus, Tantrics who admired Nabani Das Khyapa Baul and his singing for Nehru during the Freedom Fight of India. Nehru and Nabani were great friends and Nabani would sing all over India before Nehru gave his speeches. This Political connection continued with Indira Gandhi, Sanjay, and Rajiv Gandhi. The Das house on Purna Das Baul Road in Calcutta was also, a Cultural Hub due to the work Babu Kishan did in promoting his father. 2007 'Media, Broadcasting and Information Minister of India', "Priyo Ranjan Das Munshi". Das Munshi had a stroke in 2009 and has been in a coma state for almost nine years he passed away in 2017. He was Babu Kishan's aka Krishnendu Das's Economics Professor at Calcutta University and a long time friend.